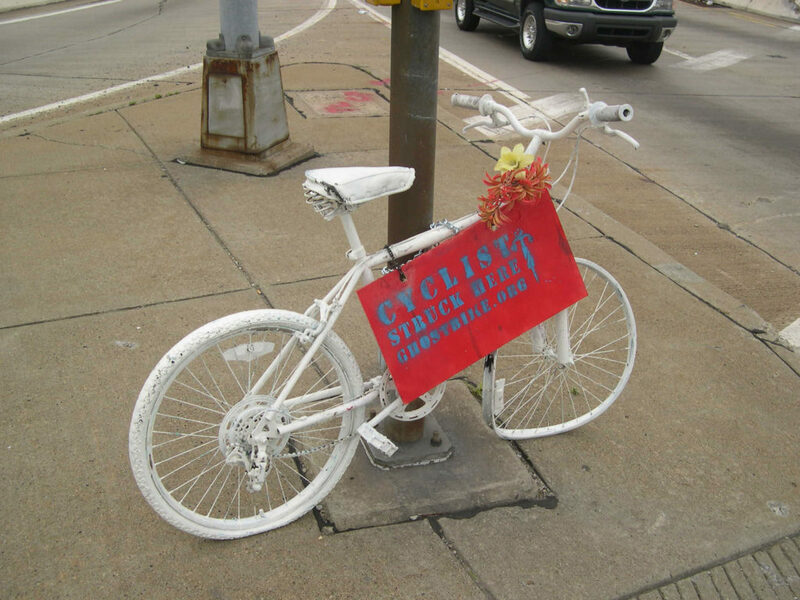 Ghost bikes, such as this one in Pittsburgh, Pa., are placed in areas where a cyclist has been killed or injured after being struck by a motor vehicle. Efforts are under way to place a ghost bike at Ninth and Tennessee streets, near where Rachel Leek died after being hit Oct. 16. A friend and fellow cyclist wants to honor the memory of Rachel Leek with a simple memorial: a small plaque hanging from the handlebars of a riderless bike, painted white. The memorial plan — expected to be reviewed by the city’s Bicycle Advisory Committee — would be the first in Kansas and would join dozens in more than 100 communities in the U.S. and abroad, where the stark displays are chained to street signs and serve to recall the memory of fallen riders while spurring others to recognize the rights of all cyclists to travel safely. Leek died Oct. 16. After a night of dancing at a downtown club, the 20-year-old was riding her bike in the 1000 block of Tennessee Street when she was hit by a car, just two houses from a friend’s home and her intended destination. As Lawrence police continue to investigate the hit-and-run case — they have identified the driver of the car, but have made no arrests — Medlock is working to see that Leek’s memory more than endures. He said he wanted to see his friend’s influence pervade the thinking of everyone who climbs aboard a bike, gets behind the wheel or otherwise makes decisions that can affect the comfort and safety of the traveling public. That’s why Medlock, a Kansas University sophomore who grew up in Lawrence, wants to create a ghost bike. By establishing a visible reminder of the dangers — and, in Leek’s case, the ultimate sacrifice — resulting from bicycles and motor vehicles sharing the same space, he figures a positive change could result. Locking a white-painted bike to a traffic signal pole at the southwest corner of Ninth and Tennessee streets, he figures, could even do more to help than other, more expensive permanent fixtures. Soon more than a dozen such ghost bikes were arrayed elsewhere in the city, and similar efforts followed in other communities, including Pittsburgh, New York, Seattle, Chicago, London and dozens more. Eric Struckhoff, chairman of the Lawrence-Douglas County Bicycle Advisory Committee, came upon one of the memorials himself a few weeks ago while visiting Portland, Ore., and found himself immediately struck by the ghost bike and its context. “It is to the point,” he said. “People, when they see this thing, they know what it is. They know what happened. They may even know who it is. He said he had already discussed the project with members of the committee and was looking forward to addressing formal plans as they materialize. “This is a worthwhile effort,” Struckhoff said. The final decision about any such memorial will rest with Lawrence City Commission, whose members already have indicated a “desire to do something appropriate and sensitive,” City Manager David Corliss said. Staffers need to look into a variety of issues, such as those involving siting concerns, maintenance costs and other details, before signing off on a plan. Medlock, for his part, is moving forward. He’s checking into possibilities for acquiring an old steel bike, and contacting other organizers about how to put an appropriate memorial together. He said he hoped the effort could help create something positive out of what has been a tragic situation for all involved. “It’s a good place to start,” Medlock said.